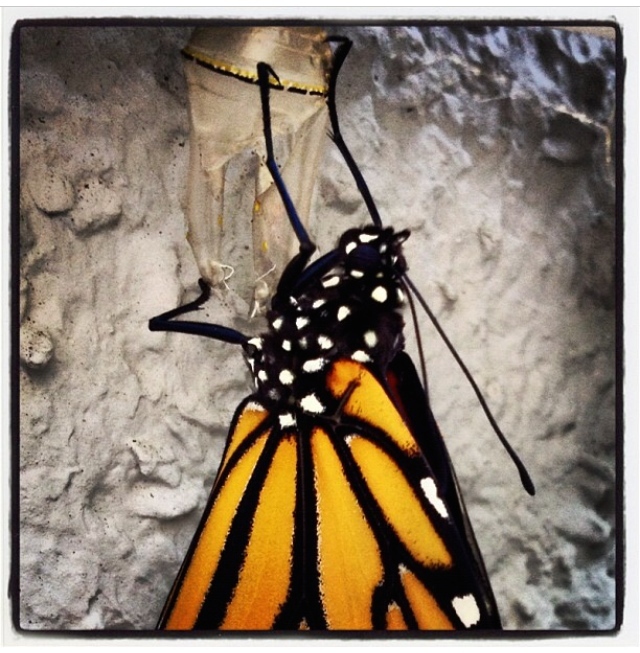 Where have all the monarchs gone? Monsanto’s killed them, every one. Oh, when will we ever learn? I have not seen a single monarch in my garden yet this year. Not a single one. Last year at this time I was watching my second batch of chrysalises hatching, their green bodies with golden spots hanging in my garden like fancy Christmas ornaments. One weekend, I watched 13 emerge in one 48-hour period, each one dropping from its green and gold escape hatch to lower its crumpled, wet wings, hanging there, letting gravity do its work until with one, then two, then a few wing flappings, it was suddenly, miraculously, ready to fly. I remember one bent-wing one, the tip of its orange and black velvet wing folded, hampering it, so that it could not fly properly. I tried to help it, putting it on my finger, moving if off the flagstones to a different spot, hoping it would be able to literally rise above its circumstances and fly beyond the garden walls. It died, eventually, its speckled body lying prostrate on the ground, belly up, it’s wings gradually tearing and breaking down further, until Nature took her back again. I am OK with Nature taking back her own. What I cannot abide is the wanton destruction of the butterfly garden by unconscious acts that sterilize the earth, kill off the milkweed, and turn Nature into an orderly prison of concrete lines, little boxes and sterile fields. I read the other day that the monarchs are being killed off because we insist on spraying RoundUp chemicals on roadsides and farm fields, to kill off weeds, and that it’s killing the milkweed monarchs need to survive. Migrating monarchs used to cover 45 acres in Mexico; now they are down to 1.65. They’ve gone from 1 billion total the year before RoundUp use to 33 million now. More info here. And people wonder why I do not spray RoundUp in my yard. 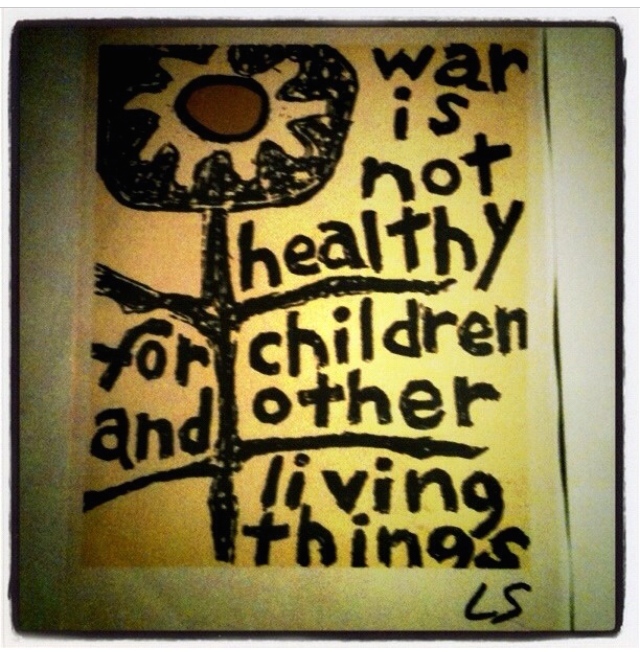 “War is not healthy for children and other living things,” said the poster in our kitchen on our organic farm where I grew up. We’ve killed them off, every one. Amen! I’m so tired of hearing of more and more and more destruction caused by Monsanto. “When will we ever learn?” Why don’t people wake up? That’s a good question, Trish. I’m not sure we know HOW to respond.’ Sigh.